B.D. 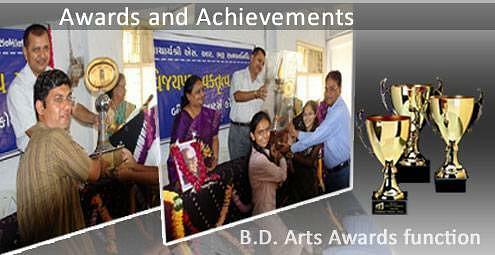 ARTS COLLEGE, Ahmedabad was established in 1956 and is a premier girls college affiliated with Gujarat University. The college has always achieved 20% to 30% higher results than the University results. The Students have won more than the 165 Gold Medals and Prizes, in university exams and hence have made their mark in various subjects like Home Science, Sociology, Economics, Psychology, Philosophy and Sanskrit. 8 first Prizes at Inter University Gujarati Radio Play Contest, the Competition at Gujarat Level. The college won five scrolls at All India Elocution Competition. The College won 165 shields and Trophies and more than 350 prizes for Inter College Elocution Competition in Gujarati, Hindi, English and Sanskrit. It had the honor of winning prestigious Mahadeo Desai Trophy 22 times. The College won 38 shields and 135 prizes for inter college Essay Competitions. The college won 10 shields for Dance, Drama and Music competitions at Youth In SPORTS, the college has been Kho-Kho champion 14 times, volley ball champion 10 times as also champion in Basket Ball for the last six consecutive years, College Level. Our players have been selected in University Teams and Gujarat State Teams in Kho-Kho, Volley Ball, Base Ball, Basket Ball, Cricket, Ring Tennis and Table Tennis. The college conducts Classical Instruments and Vocal Music classes since 15 years and the college had its own orchestra. The basic aim of the institute was to address the needs of the ‘Girl-child’ in the contemporary society and the college has obtained a lot of success in their motto too. The girl students belong to the Socially, Economically and Educationally backward classes. Students are encouraged to participate in various Exhibitions of Arts and Handicrafts, and Food festivals, N.S.S. and N.C.C. camps and sports activities etc. Students are also taught the methods to Self- Defense. The college have a well equipped computer laboratory and a well-stocked library. 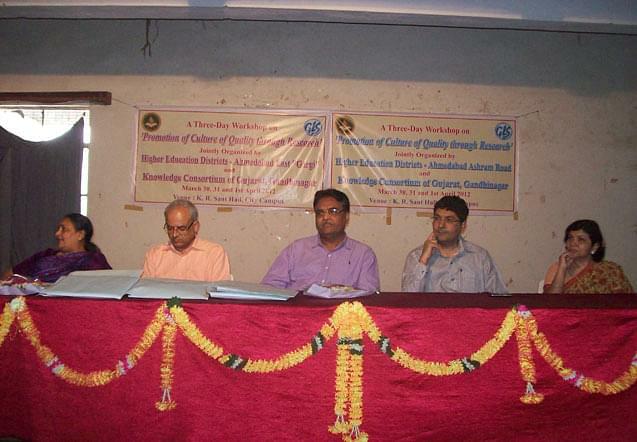 Various Lectures are arranged by eminent personalities and scholars.